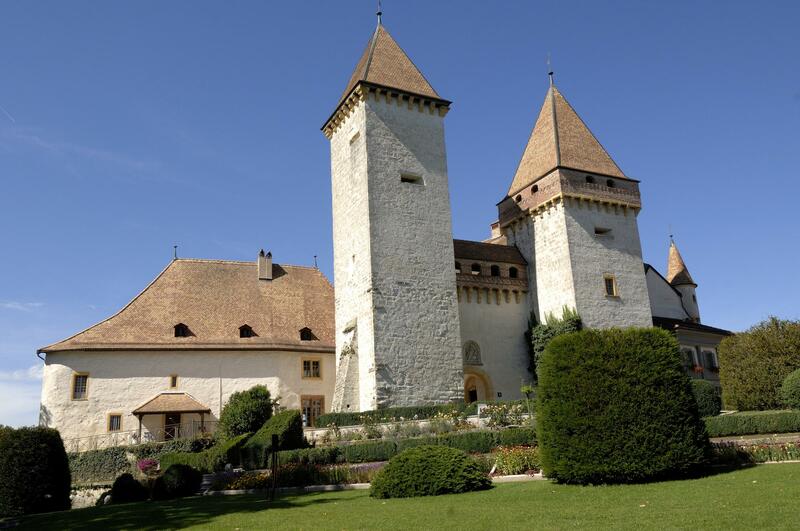 Built in 1049 on a rocky spur between Morges and Yverdon-les-Bains, La Sarraz Castle dominates the Vaudois countryside. Now a museum, it includes a collection of valuable objects acquired over the centuries by the generations of La Sarraz barons. From its construction until it was turned into a museum, La Sarraz Castle has always belonged to the barons of La Sarraz, unlike the majority of castles that pass from hand to hand. The fact that it still looks like a family home, decorated with furniture and works of art acquired over centuries, makes it a fascinating place to visit. The interior expresses the ambiance and taste of generations of a patrician family. Precious furniture, silverware and rare china testify to a sophisticated dining style. These historic rooms can be rented for receptions, celebrations, balls and weddings. In 1982, equestrian enthusiasts opened the Musée du Cheval in this historic setting. The collection includes Napoleon 1st’s saddles, the Grimsel mail coach and sculptures of horses, along with a presentation of the work of the farrier or veterinarian. Between Morges and Yverdon-les-Bains, the village of La Sarraz is dominated by an imposing castle. Here, in the castle’s barn, the Musee du Cheval horse museum tells the story of man’s greatest conquest. A fascinating place to visit for both children and parents. Le rendez-vous incontournable des amoureux de l'Art & de la Création.